"A gambler with a system must be, to a greater or lesser extent, insane." - George Augusta Sala (1828-95), English Writer and journalist. "Americans no longer believe the pitch that gambling is 'economic development', and a 'painless revenue stream.' People aren't listening to thieves promoting gambling as 'just another form of entertainment' like shopping and the movies.' The bloom is off the gambling rose and its thorns are starting to pierce the consciousness of America." - NCALG (National Coalition Against Legalized Gambling) Executive Director Tom Grey. 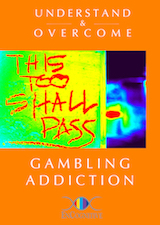 Thirty years ago, this month, I was in what is referred to as the Desperation Phase of Compulsive Gambling. I was 30 years old, married with 2 children. I was in debt for the amount of three times my annual salary. I owed two finance companies, three banks, loan sharks and bookmakers and family, friends and co- workers for a total of thirty-two people. I had just written a check to a stock brokerage firm for $4400.00 (to purchase stocks) and all I had was $10 in my account. I thought about suicide on a daily basis, but never had enough guts to carry it out. The following is part of a comprehensive study (re-written) on pathological gambling (gambling addiction) from the Library and Archives of Canada: "3. Conceptualizing, defining and measuring problem gambling." The original study is in the public domain.